Compatibility: Requires iOS 12.0 or later. The Wonder Weeks worldwide bestselling baby app is a personalized weekly calendar of your baby’s mental development that will keep you informed about the leaps and bounds and the fussy phases of your baby. THE BEST APP AROUND THE GLOBE ============================= •	Awarded Coolest App for Moms •	Awarded by Apple as top 10 ‘Best of the year 2016’ in Australia, UK, Netherlands, and a great number of other countries. •	Consumer Choice & Gold Award by MumIi •	AppRx Awards Top 10 Children’s Health App •	NHS (UK) – Best App for parents listing. •	Best App Ever Wards 2013 & 2014 (Health & Fitness) •	Top 25 App in health & fitness is most countries around the world. KEY FEATURES ============================= Keep track of your baby’s mental development Learn all about the leaps and bounds and the fussy phases of your baby Read the bestselling Wonder Weeks book here in this app Take notes about a range of topics Think of it as a portable, at-a-glance version of the calendar leap chart in The Wonder Weeks. 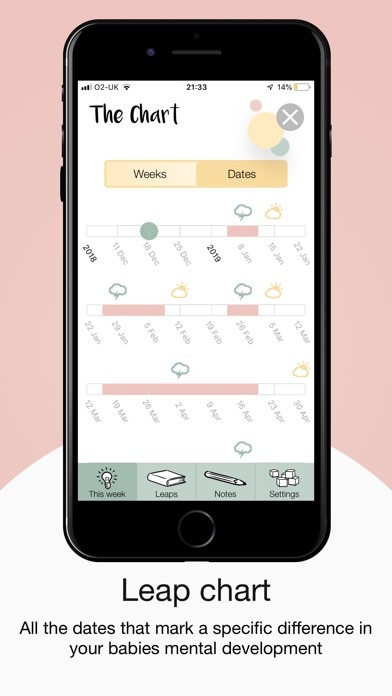 Where the book describes in-depth and easy-to-understand terms the incredible developmental changes your baby goes through, the app is the perfect leap calendar companion to track your baby’s mental development (during the first 20 months). This app is also a handy reminder for new parents when their baby’s brain is changing, or “leaping,” the baby is making a significant advance in mental development, and with each step forward comes a drastic change in the way your baby sees the world around him. Because these leaps come so quickly, the “new world” and new abilities can sometimes be scary, and the development can initially manifest in poor sleep, bad appetite, crying, clinging and crankiness – exhausting and frustrating mom and dad. "Anyone who deals with infants and young children will want to read The Wonder Weeks. This book will open parents' eyes to aspects of their children's growth, development, changing behavior, and emotional responsiveness that they might otherwise not notice or find puzzling and distressing." This App is developed with the greatest care. Neither the developer nor the author shall nevertheless be liable for any damages arising from any inaccuracies or omissions in this app. This app is wonderful! Whenever my baby is fussy it usually always correlates to a developmental leap. It’s been incredibly helpful seeing what she is going through and when, in order to better relate and hell her developmentally. I tell so many people about this app! Shouldn’t have to pay for info you can find through google! There are literally only 9 leaps on here. AKA 9 paragraphs of info about the baby. That’s it!!! The info isn’t bad but I literally could have found this info on google if I just researched it on my own. I always thought spending money on apps was dumb- never did it until this app- now I totally regret it. And on top of that it’s kind of expensive for an app! 2.99?! Anyway, I regret it and it’s not worth it. Also the “storms” calendar doesn’t line up with my baby at all. Maybe this app works for newborns or smaller infants, but once your baby starts teething/develops separation anxiety, all bets are off. There is no one size fits all app that will tell you what’s going on with your babe, he/she is an individual and will develop and hit milestones at their own pace. This app (as well as the book) has been so helpful for us. When my baby is extra fussy, I now know that he is on the verge of a mental leap, and it’s been crazy how accurate this has been. I highly recommend this app, plus I’d also recommend the book as well. This is my second child, but first child on the app. I absolutely find this app to be essential in tracking my child’s development. If you’re looking for a deeper understanding into the inner workings of your baby’s development, this app definitely provides everything you need to know. 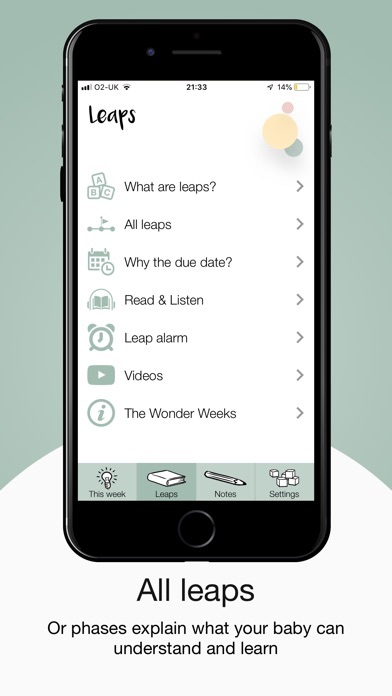 User friendly and engaging, the Wonder Weeks app makes tracking your baby a breeze! I did what the app said to do by going off my daughters due date and not her birth date...well it’s extremely inaccurate. She’s 5 months old and it hasn’t accurately lined up once. She’s fussy in the “sunny” periods and and easy going during the stormy periods. I’m not sure right now whether she’s going through the 4th or 5th leap because it’s been so off. I was really hoping this app would be helpful, but it’s not at all if it doesn’t line up. All babies are so different so I guess it was wishful thinking that this could predict my daughters sunny and stormy periods. Wonder weeks has helped us communicate and understand our little one so much better. I LOVE the information this app provides but the layout isn’t very organized.